Please note, I have put as much detail into this as I could to try to describe the process. There are actually very few steps, but I tried to list all the little nuances to consider and be aware of. I am not big on videoing, and I can’t hold a camera and polish shoes at the same time anyway, so this is going to have to do. I will gladly demo in person, at the hotel bar, the night before a feis, by appointment only ;). Old tshirt, white – cut into small pieces. I guess it doesn’t have to be white, but that’s what I always use. Small container of hot water – the water helps the polish stick to the shoes instead of the tshirt. NOTE: The shiny shoes in the pictures where shined with a very old can of Kiwi (at least 13 years old if memory serves). Recently I bought their latest product as my old can is nearly empty, but I am not impressed with the shine. It is OK but no where near the shine I can get with the older stuff. I have not tried their ‘Parade Shine’ product, which I am hoping will be more like the polish I am used to, and will let you know when I do. Bottom line, your mileage may vary. I have a plethora of old white tshirts from my Navy days, so I use those to apply the polish. I assume any tshirt will work though. Cut the tshirt into small pieces so that you can wrap it around your finger covering the tip, while being able to hold it securely with at least two layers of shirt between you and the shoe as you apply the polish. For the container of water, use something you won’t mind getting polish on, because inevitably you will get polish on it. Keep the lid off a can of spray paint or hairspray, and add that to your shoe shine kit. Wrap a piece of tshirt around your finger and dip it in the warm water, just moist, not really wet. Wipe both shoes with the damp tshirt to get any dirt and debris off them. Grab a new piece of shirt, wrap it around your finger again with at least two layers of tshirt covering your finger. This ‘helps’ keep your finger clean, but you will probably get some polish bleed through. You can try more than two layers, but I always go with two and just deal with the black finger tip. Repeat Step 3, a lot. 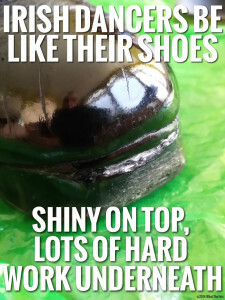 I tend to blacken the entire shoe, laying polish in pretty heavy to damaged areas. Make sure it is rubbed in well, and there are no thick spots that can rub off easily and give a spotted cow look to your poodle socks. After the entire shoe is evenly blackened, I start working on the front of the shoe and toe. You can shine the entire shoe, but the top and front is the focus area, besides the fact that doing the entire shoe will completely eat up your Friday night. I repeat step 3, continuously, still working in small circles. I keep the tshirt moist and will occassionally get a dab of polish first, and then a small dip of water on top of it, and continue the process. There is no rhyme or reason to when to dip polish first or water first, just make sure you don’t get the tshirt too wet. 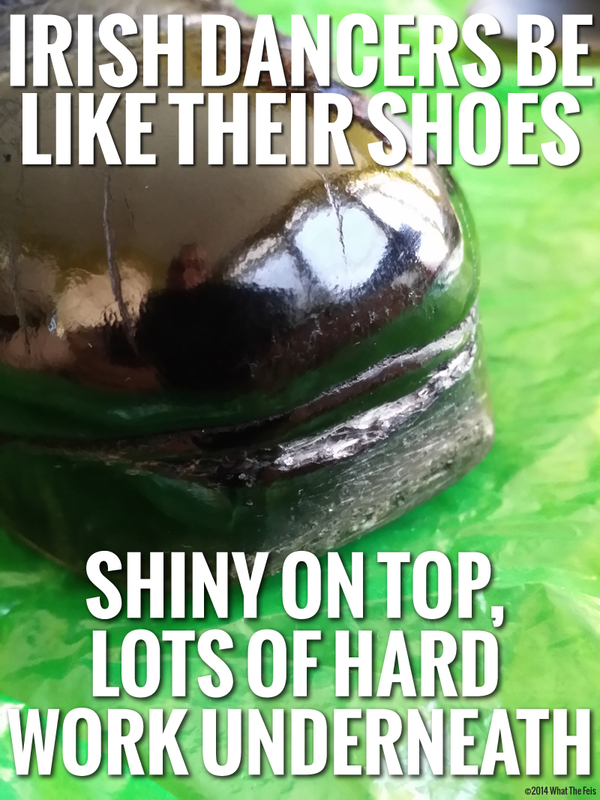 To get things really shiny, the objective is to get the polish spread over the entire area (remember, I focus just on the top and front of the shoe for the ‘mirror’ shine). Going over the area repeatedly builds layers of polish and helps fill in the grain of the leather. You are not really going to shine the leather, you are going to shine the polish on the leather, so having the leather grain filled in and having a smooth coat of polish is important. Occasionally, check the condition of the tshirt on your fingertip, as I find that the tshirt can get rough with use and can actually scratch the polish instead of getting a smooth application. You may consider swapping it out for a fresh piece or rearraging it so you are using a clean section of the same piece. This is also the reason I do not use a shoe shine brush. I know they are intended for buffing, but I tend to think they have more of a scrathy effect. Repeating the process above will begin to bring on the shine, so keep going until you are satisfied with it. Remember, you will have to do the other shoe and they ‘should’ match, so plan ahead for time. To finish off, after I have the polish worked in and start to get a nice shine, I will keep going with the little circles(making sure the shirt is not scratchy), even when the last bit of polish is rubbed in from the cloth. As long as the shirt is soft, gentle circles after you have plenty of polish applied will shine the polish. You will actually learn to feel the difference between the ‘raw’ leather and one with a good coat of polish because the cloth will slide more easily over the shoe. Depending on the condition of the leather and how well the polish is going on, this can take quite a bit of time. I have literally spent an hour on one shoe, so I find it best to set aside a lot of time, put on some mindless tv, grab a beverage, and go to it. 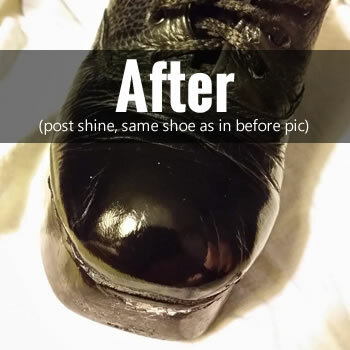 It should not take as long the next time, because you have a base of polish on the shoe, but if you go a while between shines, you may have to spend some time on them again. 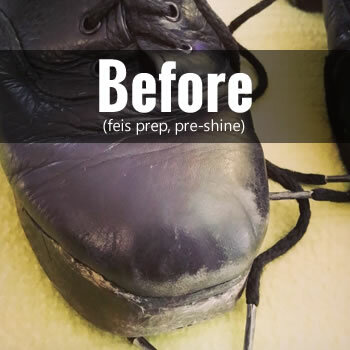 In the peak of feis season, when I am doing the shoes every week or so, I can do both in about 30 minutes, which is probably longer than you spend on them now so plan, you don’t want to get one done and run out of time. The Parade Gloss is a lot like the original Kiwi Black used to be. If it can take the abuse of teenage boys and marching band/ drumline drills it might hold up for her dancing shoes. My Dad was in the army. I ask him to shine my dancer’s shoes. He takes a lighter and lights the top layer of polish in the kiwi can. That’s his trick. He also swears by finishing the shine with an old pair of nylons. I have heard of both methods, and seen the lighter used on the shoes, not in the can. Heating the polish is kind of my point when I breath on the shoe for the last buff. I have also heard of the nylons technique, but have not done it. AMEN! No shirt for me, cotton balls and HOT HOT HOT tap water. Parade gloss or the the plain black work fine….however once you can “count your teeth in the reflection” then reach down for that “neutral” polish. Little neutral over that black and WATCH OUT! Super gloss. Plus once my Little Lass scuffs up the heavies, it comes out much easier with that neutral or clear coat. Finish off the heavies with the kiwi “edge dressing”. Kiwi does NOT make the “Honor Guard” edge dressing anymore but the squeeze bottle with sponge top is better than markets or paint! Have never heard of it Angelo. Would love to see some before and after of results. Thanks!